I am so sorry for the long delay in blogging. It seems when I returned from Japan real life set in – that translates as the needs of one house, one husband, two children and an old cat. Blogging became secondary to vacuuming, laundry, helping with homework, grocery shopping and a litany of other things that unfortunately are part of my dharma. Though I crave the freedom to be able to practice as I like, meditate every morning and devour thick tomes on yoga and philosophy it really isn’t a practical reality. When I do hit the mat or get to go away to study though, I fall into it with an appreciation that most people could not understand…unless they are too a working mother with a crazy life. I came back to Japan for work four days later. 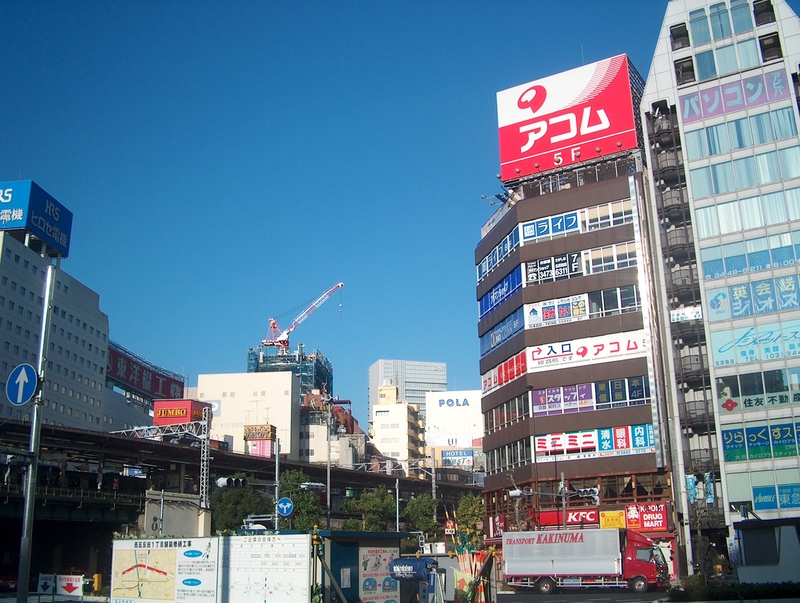 I had a two day downtown Tokyo layover. Since I had free time, I asked the CEO if I could offer my time and do a demo for Lulu Japan. They then talked about maybe gorilla yoga instead, then the store said they had a pilates event already that day and could I participate in that? Then they said I could come to the pilates event – but no one would be able to talk to me about anything as they would be too busy… so could I come to the store at 6:00pm to chat? Not wanting make the Japanese community educator feel pressured at the event to have to deal with me, I bowed out of the event and went and met friends to take some photos. I went to the store at 6:00pm ( not knowing that the CEO went to the event looking for me… yabai! not good..not good at all) and they were in a meeting and too busy to see me! Yappari na! I had similar experiences with Lulu Canada but was surprised to see something similar across the pond so to speak. Oh well- all was not lost. I was introduced to a fellow Japanese ambassador at the store, Padmini, and we hit off so well that we spent the next two hours chatting at Starbucks and talking about me teaching a workshop at her studio. Funny thing was that when her English boyfriend came to join us for tea he realized that we have a mutual friend. I mean come on! 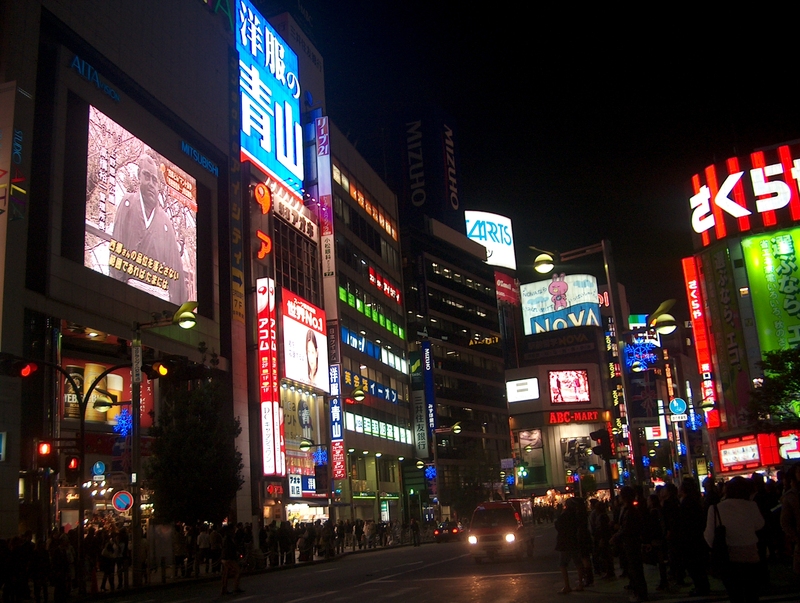 The middle of Tokyo with all it’s millions and I meet someone that has a friend in common with me… and wouldn’t you know it but I took the mutual friend home on a flight the next day! I think he was even more shocked than me when I told him about running into Padmini and her boyfriend. Sekai ga semai– small world. Oh well , better luck with Lulu in the future. I would have loved to do a demo or something in December but my flight schedule was not conducive to it. Maybe January. On a last, and much happier note, the photo taking experiment was amazing. I took a chance on a mutual blogger, Q, who takes great editorial photos for his blog. He is not a professional but there was something in his style I really liked. He agreed to meet me and shoot some photos and he showed up with his friend K who is also into photography and basically semi-professional. 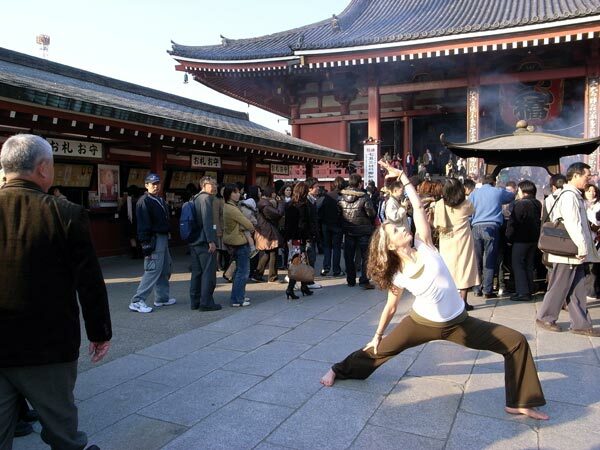 We spent two hours around Asakusa Temple taking random shots. It was so great to be with two ex-pats that understand Japan as I do and have them try to capture that wa yo feeling. I think they did a pretty good job. Tell me what you think! 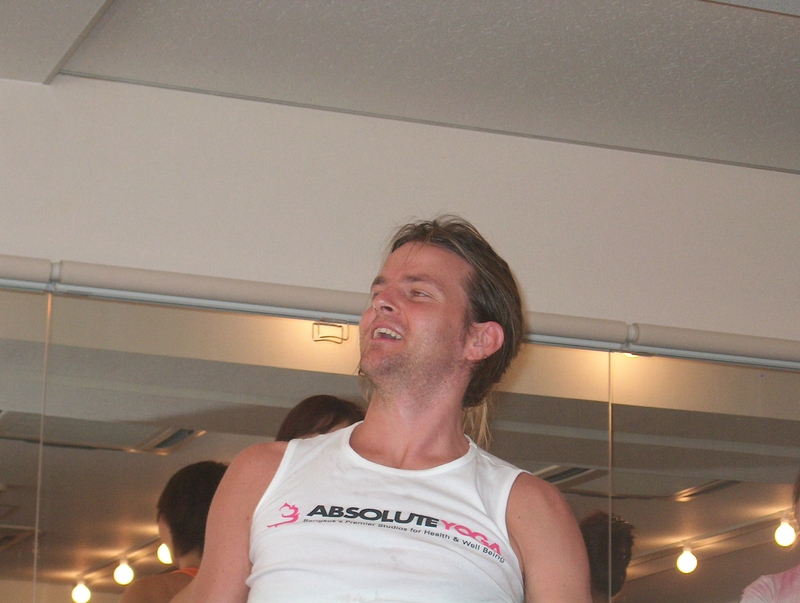 And yes…everything I was wearing was from Lululemon. So much happened on day five of training. It was like all the information we had taken in during the first four days were thrown into a centrifuge and spun around at this high velocity so that at the end of the day only the essential elements of the teaching were left. It was brilliant. I can’t believe in a year how much my practice has grown, changed, and opened. I compare myself to this time last year when I first studied with John in Maui. I thought I knew something about Anusara and then got there and realized I knew next to nothing. This year I prepared, studied, applied myself and realized I knew much more than last year…. but I still knew nothing. The bar is continually raised. 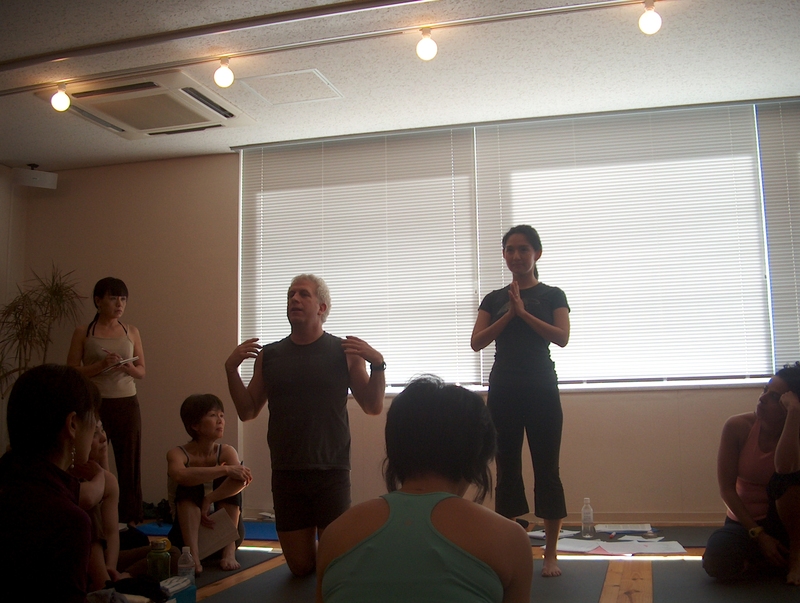 The Japanese have to be some of the best yogis I have ever seen. They have this wonderful mix of openness and strength. I kept thinking of yanagi- willow trees. They bend and drape with exquisite beauty but they are still so strong at the core. Mika- the princess- regal and graceful. Misa- big beautiful eyes like a child but with a inner strength. Tomoko- beautiful on the inside and out- her heart is so compassionate. Keiko- bright like a little star with a quick mind to match. Kana- from her funky nails to her big smile she has the best laugh- she is lalita. Aki- so soft and luminous- she shines from the inside out. I learned so much from all of them- I hope our friendships will continue and grow through the years. The last afternoon we did a 90-minute class taught by John. He took everything he had taught us during the week and applied it all in one class- he wrote everything on the board before we started- what the crescendo pose was and worked back and forward from there. He wrote down times for the sequencing to ensure there would be time for a slow down and good meditation at the end. He wrote down the heart theme and the alignment focus. Then he kicked our butts- in the best way possible of course. It was fun and exhilarating with full musical accompaniment. 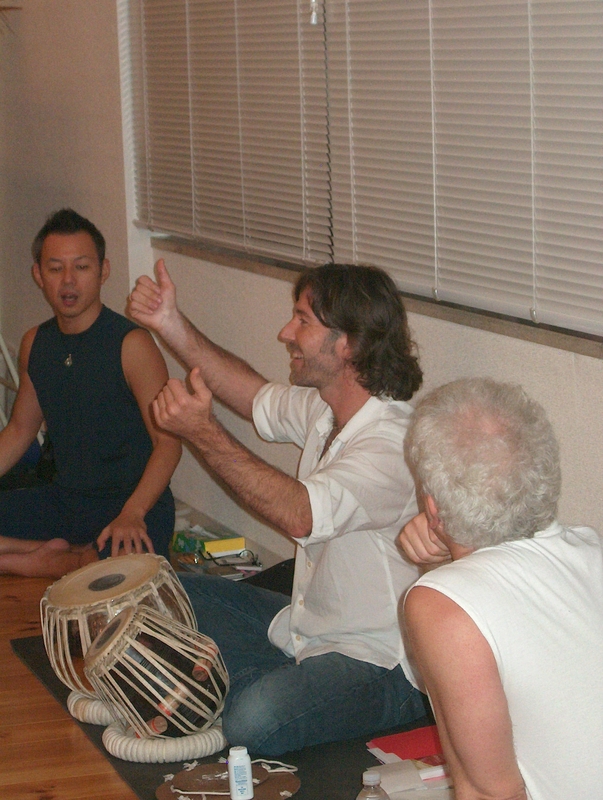 Ty Burhoe– Amy Ippoliti’s husband- played the tabla. I saw all the backbend sequence and I knew it was going to be challenging for me- the high point was full eka pada rajakopatasana – my favorite pose to look at…but not necessarily to do. (I do have a great pose lust for it though) It is the full pigeon backbend holding on to one foot. My students are probably laughing but you have to understand the high physical level of the yogis in the room- you guys don’t think I am stiff but compared to them I am! I was actually stiffer this week than normal- it was frustrating. I tried to let go as much as I could. 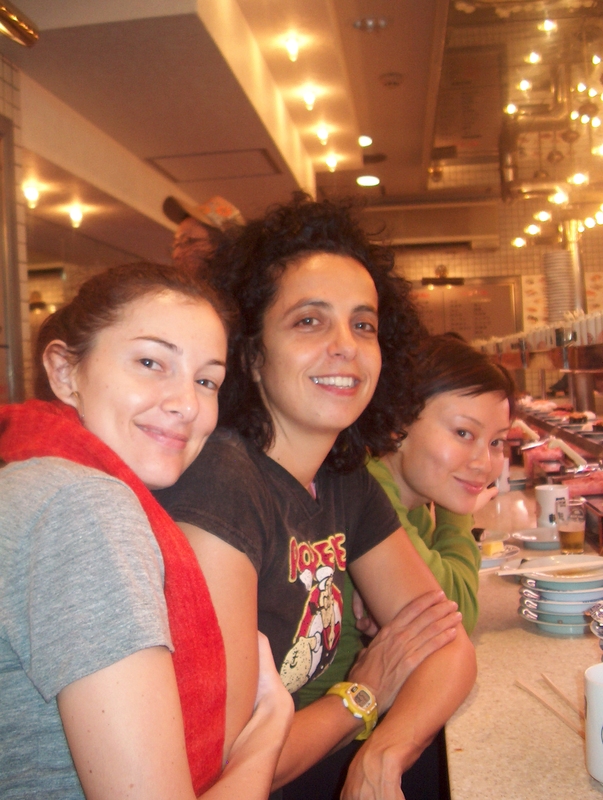 When I could no longer hold a backend, rather than coming down frustrated at my abilities, I looked to Kana on one side of me and Aki on the other and celebrated their abilities- they were having so much fun. I am so grateful to my family and friends who made this trip possible. I am grateful to John for accepting me for training. I am grateful to Christina for preparing me properly. I am grateful to my Kula at home- Shelley, Lauren, Carol- whose faith in my ability to teach is unwavering…even when I question myself. I am especially grateful to my husband Chris- I couldn’t be on this path without him. He was also Mr. Mom for a whole week and he didn’t complain once! 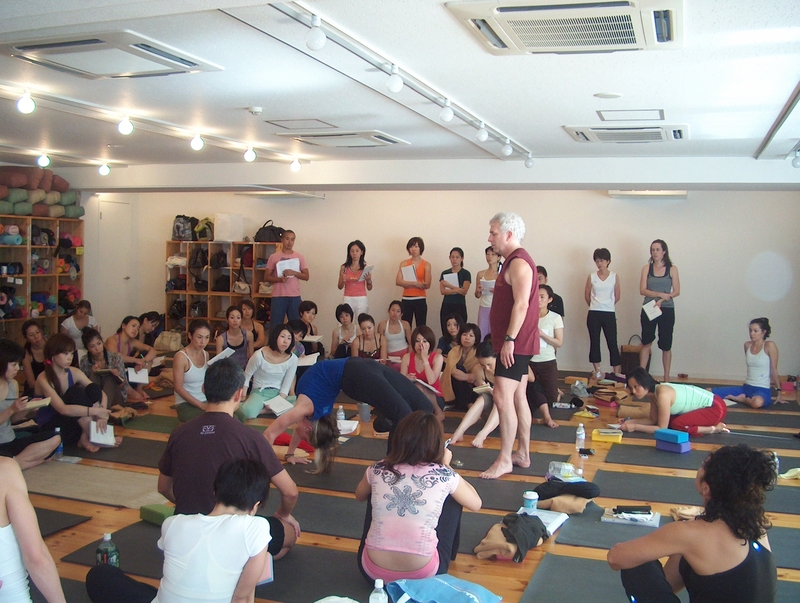 Tokyo teacher training was the highlight of my Anusara training to date- a bringing together of my two passions- yoga and Japan. Now all I can think of is how can I get back here next June! I have to vent. I have been living in Internet cafes during my lunch breaks and sometimes after class as well and the problem is I am starting to smell like an ashtray! I am happily plopped in a Starbucks this morning but I have no Internet or power- but at least I can breathe! You can still smoke pretty much anywhere in Japan and coming from the land of “no smoking anywhere” (Vancouver you can’t even smoke outside in some places); it is kind of shocking. When I go to a restaurant here in Japan I ask for no smoking…but the table right beside me is smoking! Arrrgg! The funny thing is that you can’t talk on your cell phone on the trains..only text. Courtesy and health seem to be two different things. I hung up all my clothes and opened the window the other night to try to air my stuff out- even my hair reeked of smoke. The sad thing is that I don’t know if the Japanese don’t care it is unhealthy or they don’t know. I remember reading that the Japanese don’t really believe that smoking causes cancer- they think that the link between smoking and cancer is over emphasized. There is hope though. I noticed on the street outside the studio which is mostly a pedestrian street had policemen every block. I looked at their uniform and then I realized that they were by-law officers. They were enforcing a new policy- no smoking on that street. Anyone caught smoking would be given a ticket and fined. Wow- maybe there is progress. Day four has come and gone. I finished my full day with a Japanese bath. For those of you that have never had a Japanese bath I will explain the pure exquisiteness of the experience. (This one is for my bath junky friend Christina). I know we all have bathtubs at home so you are wondering what the big deal is. A bath is a bath right? WRONG. You see, the Japanese take something that already exists and refine it until it is the best in the world. The Japanese see the bath as something more than utilitarian – it should be an experience unto itself. You usually bathe at night. You first wash and scrub the whole body clean. You then step into the deep tub, which is neck high in luscious hot water. The temperature is just right. Very hot at first, and then as it sinks into your bones, it becomes perfect- taking all the stress and tension out of your muscles. My bath water actually flowed over the sides of tub to cascade over the tile floor. The whole floor of the bathroom is like a shower so this caused no problems. It was the height of decadence. This was more than a bath; it was the art of bathing. In yoga we call this refinement Shri- beauty. As most of are teachers in the room in Tokyo, we can all do the basic postures but John was taking us to a new level today. Not harder poses- just basic poses where we started from the main principles and built up a part at a time until we were refining our fingers, our eyes, even our mouth. I was thinking the Japanese of all people would get this lesson. Mika–san did the best demo- she had the face of royalty as she sat in her twist and John placed a block on her head like a crown. It just balanced there perfectly as she came out of the twist- regal head and soft beautiful face to the end. I really think she is one of the best teachers here in Japan. I thought about my back bends in the tub today. I pushed the back of my head into the edge of the tub to release the tension in my shoulders more. I realized that I forget that shoulder loop starts in the mouth- I get so focused on getting my shoulders back that I miss a key component. No wonder it takes years to get certified in Anusara Yoga- it takes years to practice and embody all the information. John got me to demo drop backs today- yes- the stiff girl did the drop back demo. And I have pictures to prove it! I felt so safe when John helped me go back- it was such an amazing feeling. Remember how I mentioned on day one he zeroed in on my upper back? Well he said to me that first day “Yeah- we will break that open this week” and he pushed on the stiffest part of my upper back. I wasn’t scared- I was excited. You know when you have an itch you can’t scratch? Well my upper back is like that. I feel that if I can just get it to bend the right way or a certain way it will crack right open and release. Well after he dropped me back he started to adjust me to allow for a greater opening. It felt so good. I wish I could get somebody to do that to me every day for a month- my back would be like butter! The other interesting part of my day was after yoga class. Mr. Smith from the plane (his name is actually Scott) emailed me and invited me to a function at the Canadian Embassy. (How posh!) The CEO for Lululemon Japan would be there and I could get an introduction. The funny thing was I had very little dress clothes with me and my “nice” top was actually from Lululemon. Talk about a poster child for the company! I haven’t been to the embassy in years and I forgot how beautiful it is. The function had fabulous food and I was given a chance to meet the CEO of Lulu- who also was in all Lulu clothing. A sea of black suits surrounded us and we stuck out like typical Vancouverites. No one even batted an eye- I love the Japanese for that. Other high-level business people joined our conversation and before I knew it I had something in common with everyone around me. One guy worked with an old friend, another sold the same product as my husband, and another was doing business with the owner of Studio-Yoggy- whom I had just met on Tuesday at the training. I don’t know if was just all the backbends today but I really felt in the flow today. They all thought it was so funny I was a flight attendant and a yoga teacher- they all thought I was in sales- or I should be. Many of them wanted to know if I wanted a job! I guess I am in sales though. When I teach yoga I have to sell my theme- I have to get people to buy my philosophy. It’s nice that what I have to sell is refined and beautiful- satisfaction guaranteed. And so far no one has asked for a refund! The game is up…John asked for my blog address. Well John, if you are reading this I fought to edit it for your eyes. The Japanese call this hone and tatemae. 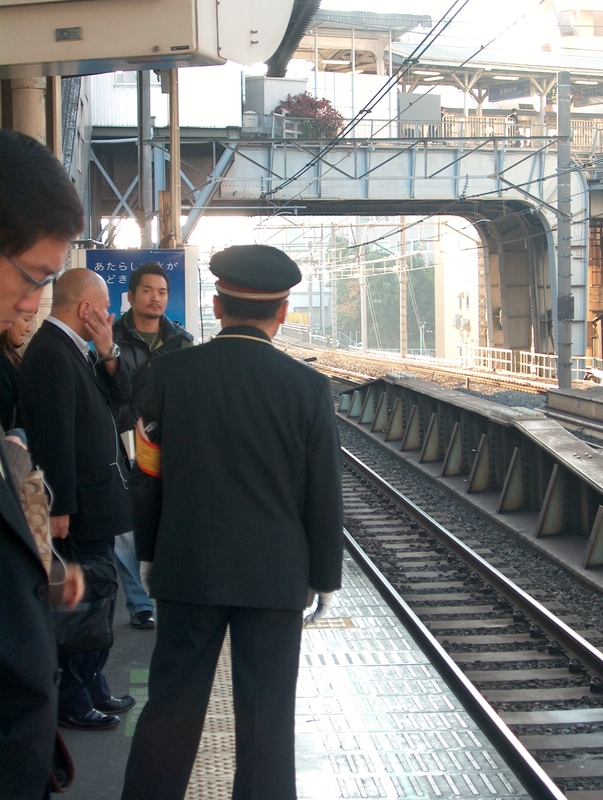 Hone– inside face and tatemae-outside face. Everybody gets my hone on my blog- the real me- silliness and all. I can’t believe we are half way though training. It seems to be flying by. By the time I look at my watch it is already 4:30 in the afternoon and we started at 9:00. We have a little over an hour for lunch break and then we go back again. The days are long but we seem to be infused by the desire to learn as much as we can in this short week. The dedication, the commitment, the studentship is unsurpassed. In Sanskrit this is called adikara. Christina Sell, my mentor teacher, was vehement that the most important thing in training was studentship and she is a great example. She is an amazing teacher and practitioner but she is also an incredible student. She is continually studying, practicing, pushing herself to learn more. She is who I want to emulate as a student. Today we used the theme of commitment. Commitment to be the best teacher we can be. It was interesting to see how my mind processed the theme throughout the day. As I thought about balancing the theme with a contrast that was soft I started to think ” Why?” “Nazei?” Why do I want to be an Anusara yoga teacher- why do I want to be the best. For fame..fortune?? That made me laugh. Most yoga teachers will tell you it sure isn’t for the money- most yoga teachers I know just get by. Then of course John- mind reader he is- asked us to ask “why?” I thought about it for the rest of the afternoon. I came up with one clear answer- I want to share. Every class I teach I try to teach from something that has happened to me – my own experience. I struggle often but other days I hit that very strong center of feeling and the words just come. One of my dear students has been diagnosed with colon cancer. She is one of the most vibrant, joyful people I know. She is 6 feet tall, 60 years old and always has perfect hair and makeup. She does headstand and giggles infectiously. She lights up the class… and the studio has seemed a little darker in her absence. I went to go visit her the other day before she started chemo. In all her pain and struggle, all she kept doing was thanking me for teaching her. 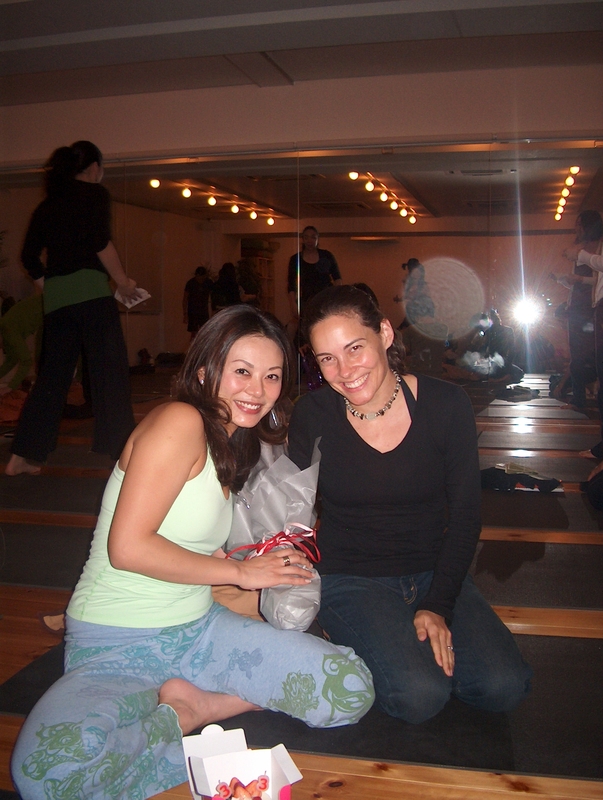 For accepting her stiff body and for teaching her that yoga was more than postures. To her it was a way to practice opening her heart and continuing to learn. She used things I had said in her job as a motivational speaker. She said she was wary when I took over from another teacher. He was very gentle and soft. I demanded more of them- physically and mentally. I asked them to think about what they were doing. It scared her at first, but then she realized that what I was teaching was so much richer then her previous experience. Yoga moved off the mat and into her daily life- and for that she was so grateful. Yoga is how she was going to cope with having cancer. I was blown away. I had no words. That is why I am committed to being the best teacher. I want to be a hell of a messenger.